When it comes to health check, triglyceride test is important, especially if you are a high cholesterol person. However, for most people, a weighing scale works just fine to get a quick feel of the health. What would be a “weighing scale” for innovativeness of an organization? Can we have something simple and yet representative of innovation health? In the table above I have tried to present a simple dashboard. I find this useful while working with my customers as well as while studying evolution of innovative organizations like 3M, Toyota and P&G. Let’s look at the four parameters. · Pipeline: This is an indicator whether idea funnel is getting filled regularly. 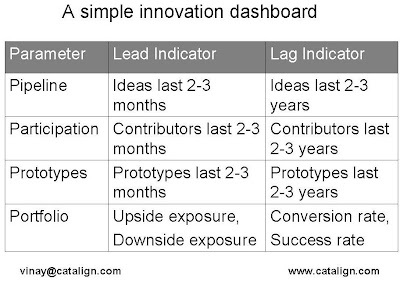 A lead indicator would be the number of ideas generated last few months. A lag indicator would be the number of ideas entered the funnel in the past 2-3 years. “idea per person per year”, a parameter Toyota uses, is also a good indicator of pipeline. For Toyota, it went from 0.1 in 1951 to 48 in 1986. INSSAN data suggests that the average “idea per person per year” is around 5 for the 30 odd participating Indian organizations in 2009. Ideas generated through Cisco’s i-zone + i-prize collaboration portals went from 80 to 1100 in one and a half year’s time. · Participation: This parameter tells us where the ideas are coming from. The more people and the more types of people (customer, partners) contribute the better. Toyota’s idea management system tracks the percentage of employees suggesting the ideas. In Toyota, employee participation went from 8% in 1951 to 95% in 1986. This number is 100% for TVS Motors and the average hovers around 60% for the participating companies in INSSAN survey in 2005 to 2009. · Prototypes: What happens to the ideas after they are generated? Do they remain as just ideas or move forward as experiments? This parameter represents the experimentation capacity of the organization. For a leading captive center in India of a global European firm, for the 400 ideas in 2007, there were 45 prototypes built (roughly 1 in 10 ideas got prototyped). Ideo, a leading design firm from US, prides itself in developing several hundreds of prototypes every year (exact number is not known). Note that for a services firm, a prototype may be a video showcasing a new customer experience. · Portfolio: Are all your ideas incremental? Or on the flip side, are all your ideas potential sixers? Every organization needs to balance between risk and rewards. You need a number of incremental ideas that are low-risk, you also need a few ideas that are potentially your “iPod” or “iPad” category. A portfolio also needs to be assessed for potential hazards. For example, patent infringements (TVS-Bajaj battle) or possible product recall (recent Toyota recall). 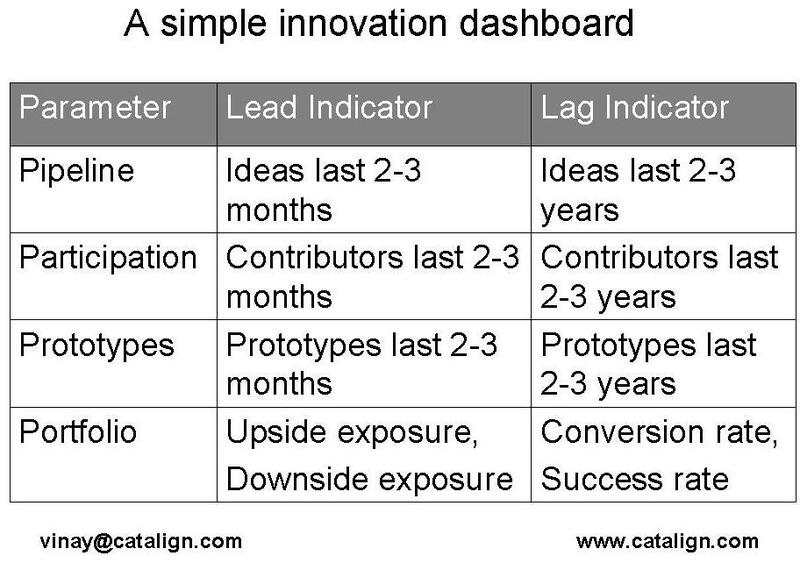 Finally, you need to check your success rate or what A G Lafley calls “batting average” – What percent of your implemented or launched ideas succeed? AG is happy with 50% while Martin De Beers of Cisco has set a goal of 75% or higher and currently running with a batting average of 90%.